WASHINGTON (AP) -- Andy Roddick won't be going for gold this summer. The highest-ranked American tennis player is skipping the Beijing Olympics, choosing instead to focus on preparing for the US Open by playing at the hard-court Legg Mason Tennis Classic. "My goal every summer is to win the US Open," Roddick said in a statement released by Legg Mason organizers. "I have won the Legg Mason Tennis Classic three times and feel defending my title in Washington best prepares me for another Grand Slam title." The Washington tournament runs Aug. 11-17, the same dates as the Olympic tennis event. The US Open begins Aug. 25. Roddick, ranked No. 6, won his lone major championship at the 2003 US Open. He won Legg Mason titles in 2001, 2005 and 2007. 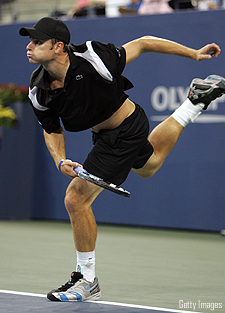 Roddick has been a regular on the U.S. Davis Cup team, which won the championship last year. He lost in the third round at the 2004 Athens Olympics, and said at the time: "Some guys really don't care that much. I cared a lot. It's not the biggest thing in our sport, but it's the biggest thing in sports."